Welcome to Fantasy Football Captain Picks Gameweek 8. Prior to my guest appearance on the FPL Surgery Podcast, I was asked what kind of FPL manager I was; ‘A conservative manager, prone to occasional, irrational moments of reckless abandonment’ was my response. Conversely this probably accurately describes my real life persona, although my fellow contributors who’ve actually met me would say its more like; ‘bloke who witters on a lot and falls asleep at dinner’; no less true. So I’m risk-averse, but on occasion behave a little ‘crazy’. Don’t get me wrong, I’m not one of those people who describe themselves as ‘crazy’ (you’ll find people who say this seldom are), but every now and then I’ll do something that goes against the grain of how I normally approach things, and this, of course, transcends to my FPL team. Last week was one such occasion, where my reckless side was on full show. 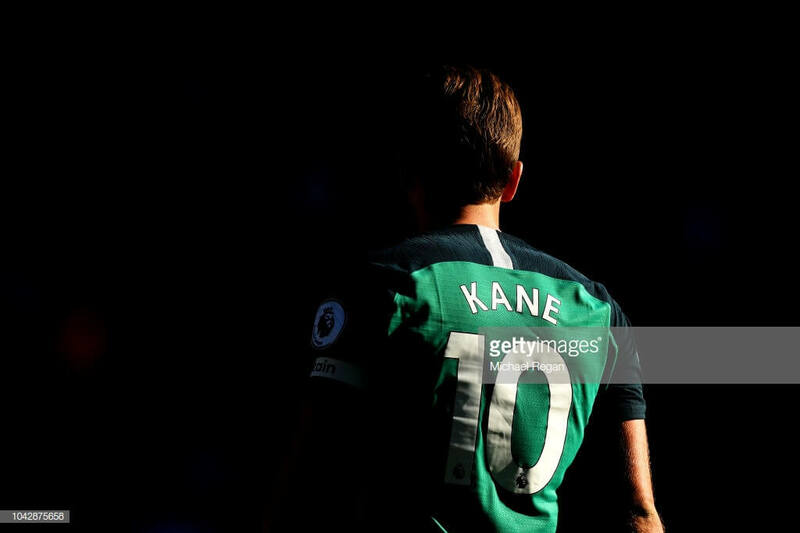 ‘Should I take a -8 to bring in Harry Kane and Matt Doherty or just play it safe and do Mane to Hazard?’ I asked anyone and everyone who would listen. Mane to Hazard was the advice across the board, and rightly so. That was the move I made. Do I regret not taking the hit? Yes, of course, do I hold anyone who advised against it responsible? No, of course not. At the end of the day we’re all masters of our own destiny, we make the final call. I advised more than my fair share against similar moves, some of you probably listened, some maybe not. Why am I telling you all this? Well for starters it’s cathartic, but that doesn’t benefit you a whole lot. The real reason for all of the above; it’s pertinent to this week’s captain choice. As most of you will be acutely aware, there is one man who is the standout captain choice this game-week, we’ve all got Harry on our minds. Some of you have him already, some of you have the luxury of 2FT’s or even a Wildcard in your back pocket, the problem for many of us (myself included) is that to get him in, we’ll need to take a hit, and probably at the expense of one of our other premium assets. So do you take the hit? Play it safe? How about we look at this week’s best captain choices; the rest is in your hands. Let’s get the obvious one out the way first eh? 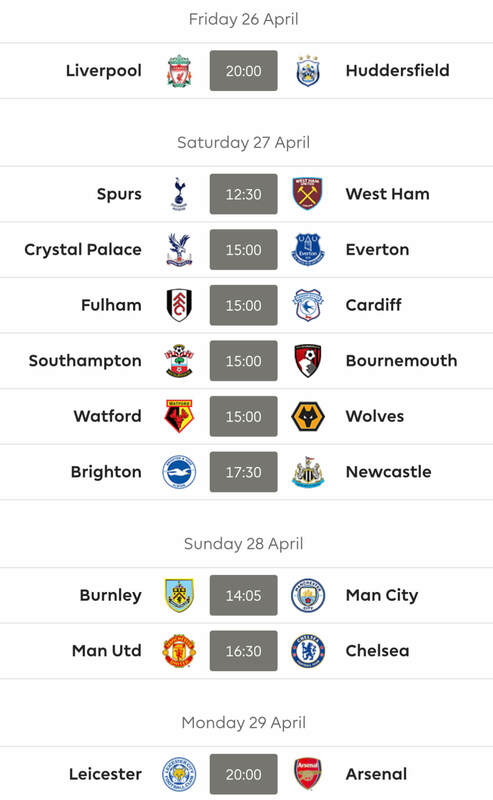 If only we were blessed with two Free Hit chips each season, I imagine a fair few would be used this week, with Harry Kane a shoe-in for what looks like the type of fixture where form could go out the window; a three or even four-goal haul is entirely feasible. Many with one eye on GW8, brought in big Harry in GW7, they were duly rewarded with 2 goals and 3BPS, we should have seen it coming, he did the same thing last season at the John Smith’s Stadium. It’s been a few seasons since he’s has had such low ownership (27.1%) at this stage of the season, but at £12.5m, it’s been hard to justify his inclusion, especially when cheaper players such as Aleksandar Mitrovic are performing better for a lot less money. However, as he showed at the weekend, you don’t need to be in great form to pick up big points, especially when you have penalties. Almost 70,000 managers had drafted him in with GW7 still in play. Knee-jerk? No doubt, but that’s how many play the game. It would be interesting to know how many of that 70k realised he has the small matter of a game against Barcelona this coming Wednesday. The good news for those who do own Harry, or for those thinking of bringing him in, is that even though he still looks a bit knackered, he’s getting chances. Only four forwards have more than the 20 shots he’s had to date, and all 20 of those have been inside the box. Belter. Cardiff sit second from bottom, no team has conceded more than the 16 they’ve shipped to date. Goalless draws against Newcastle and Huddersfield have given their underlying stats a look of respectability, but read between the lines and you’ll see that only 5 teams have conceded more shots inside the box (69), and only 3 teams have conceded more shots on target (41). Cardiff are very quickly becoming that team whose fixtures you check when picking your captain, illustrated perfectly by Eden Hazard in GW5. Is Harry back to his best? No, not yet. Will he need to be? Probably not. It may be Harry’s turn to pick up a 20-pointer. Not a day goes by without the press reporting yet another ‘drama’ unfolding at Old Trafford. It can’t be much fun being a Manchester United ‘fan’ these days. Such is the regularity of negative press, fans of the Red Devils may be better served ignoring the sports section of their London Evening Standard altogether. Thank goodness they don’t have to actually go to the games. Last week it was Paul Pogba who took top-spot on manager José Mourinho’s sh*t list. Not content with being a bit of wazzock at the best of times, he thought it wise to criticize Jose’s tactics in the aftermath of their 1-1 draw against Wolves. To be fair, Pogba doesn’t seem the sharpest knife in the draw, but surely even the most dim-witted of folk would realise that no good would come of this? It would appear there is something of a power play unfolding at Old Trafford. Has José lost the dressing room? Judging from their half-arsed display against West Ham at the weekend, it’s hard to argue otherwise, and let’s face it, if it were any other club, or even any other manager, he’d be long gone by now. So with all that being said, why on earth would I suggest captaining one of their players? Well, the team they face this game-week is even further up the creek, and a loan deal on a set of paddles has not been forthcoming. I don’t have many positives to say about my hometown club, I was at the game against Leicester at the weekend and I struggled to draw anything positive from the match. If Rafa had been given even half the money he was promised to invest in the squad, I’m not sure many of the starting 11 would make his team. Other than our goalkeeper we look like a Championship side at best, I’m not convinced we’d do that well there either. Last week I joked that we tend to only either draw 0-0 or lose 2-1, well I was wrong, we now lose 2-0 too, it’s no joke, believe me. Only 3 teams have conceded more than the 104 shots we’ve succumbed to thus far, 71 of those were conceded in the box. If I had to back a ‘Utd’ player against us this week, it would have to be Romelu Lukaku. Despite the rumoured schism, and never-ending dramas that have engulfed Old Trafford, the big man has stayed away from controversy off the pitch and has been doing what he’s supposed to do on it. He may not be hitting the heady heights of his Everton days, but he’s been steadily picking up points, with a return in three of the six full matches he’s played in. 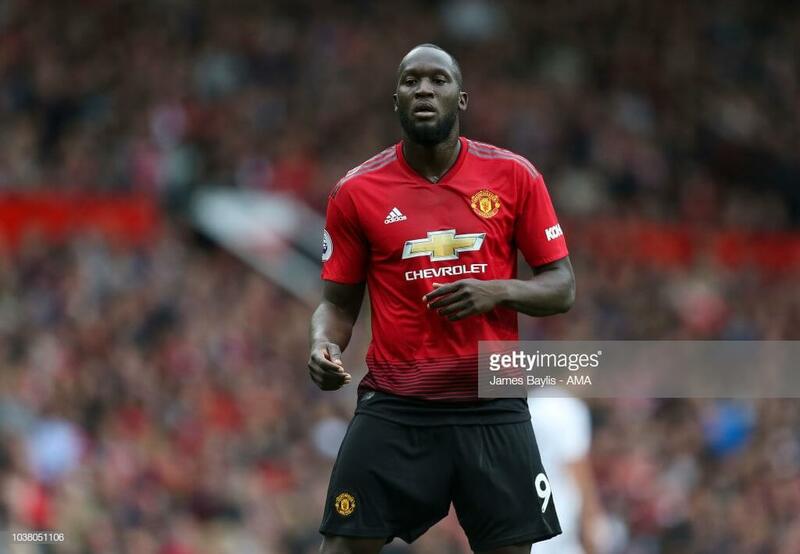 With 4 goals to date, a quick look at his underlying stats show that only 5 players have had more than his 18 goal attempts this season, throw in the fact that all 18 have come inside the box, and that he’s currently joint-second for big chances (7), and you have a compelling argument that Big Rom could be a shrewd pick in a week when the usual captain choices are off the board, or the best ones out of reach. 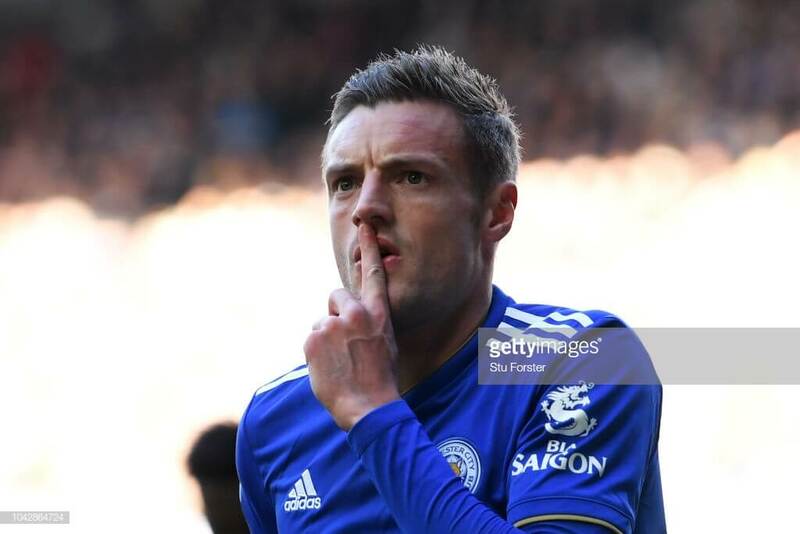 If you’re familiar with my articles you’ll know by now that I have no particular fondness for Jamie Vardy, but having watched him at the weekend I have to say I was impressed. I’ve always known he’s a menace to play against, but I don’t think I’ve ever fully appreciated what an outlet he is for his teammates. He runs non-stop, chases down every ball, I actually watched him and thought ‘I wish he played for us’, yes it was a bad day. His penalty at the weekend took him to 3 goals for the season, he’s not exactly tearing up trees, but it’s a reasonable return given the fact he’s only actually played 4 ‘full’ matches thus far. It’s also surprising just how low his ownership (4.5%) is, especially when you consider that he’s picked up an impressive 19pts in his last 2 game-weeks. His underlying stats show that he compares favourably to similarly priced players, his 14 goal attempts are level with Roberto Firmino, who has scored a goal less, despite playing 251 minutes more than the rat-man (sorry I couldn’t resist any longer). His opponents this week will be buoyed by their 3-0 victory at home to Fulham, but the Toffees do not travel well. Of their 3 away fixtures to date, they have yet to claim victory or a clean-sheet, shipping 6 goals in the process. I’m not saying that Jamie Vardy is a fantastic captain choice this week, but he is one of the better ones. 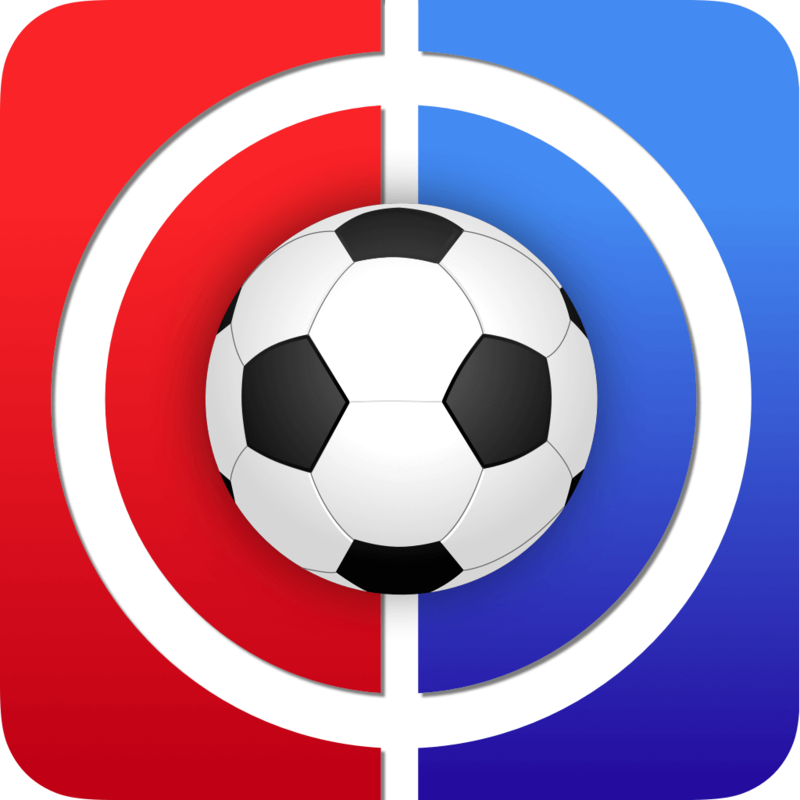 After watching the dross at St James on Saturday, the last thing I wanted to do was watch more football, but when you write articles, and it’s your ‘turn’, it was more obligation than desire that had me tuned into Chelsea v Liverpool. I’m glad I did. If anything, I was able to switch off and forget the turgid football I’d just witnessed, and for the first time this season, I was able to actually enjoy an Eden Hazard goal, it really was a thing of beauty, on so many levels. I’ve owned Hazard in seasons past, but not this Eden Hazard. So often an infuriating player to own, I’ve bought him following a ‘haul’, only to watch him turn in a series of 2 pointers, then its a case of ship him out, with exclamations of ‘I’ll never bring him in again’. There’s no denying that Hazard is thriving under Maurizio Sarri, but in fairness, the ‘new’ Eden was there for all to see during this summers World Cup, he’s added a consistency to his game that makes him FPL gold, a bonafide captain option home and away. The Saints have won just a solitary game this season, a surprise 2-0 victory away to Palace in GW4. At home, they have yet to face a top 6 opponent, with 2 draws and a defeat. They’re not the worst home side this season (yup, that would be Newcastle), but I have no doubt that they will offer little resistance to what is surely another Chelsea victory, and fingers crossed, another Eden Hazard master-class. It’s 60pts on the season so far, 6 goals, 2 assists and 10BPS. Such is his style of play, if he has any sort of return in a match, he’s almost guaranteed BPS; usually all 3. I think he’ll blow his all-time FPL score of 233 out the water this season, I’m sure if presented the chance he could probably walk on water too. 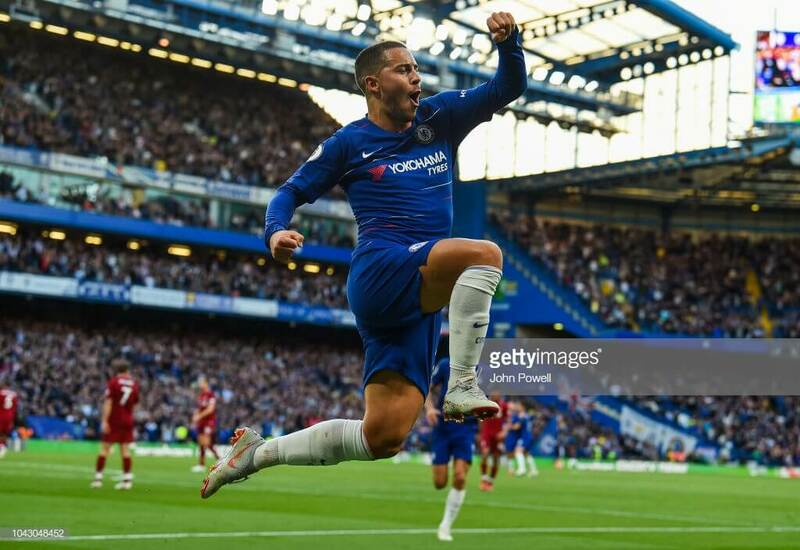 It may sound as though I’m having some sort of ‘Eden Hazard love-in’ right now; let’s just say he was a bright light on an otherwise dark day. This game-week, when all roads seem to lead to Harry Kane ©, Hazard offers a genuine alternative. Finally, we can put our trust in a player who may actually be one of the best in the world after all. Thanks for reading Fantasy Football Captain Picks Gameweek 8. This article was written by Rosco. I am going with Hazard as captain this GW. I would bench Zab and play Mitro. All done. 2 FT used, goodbye Salah and Auba and hello Hazard and Kane. I’ve done Kun > Arnie and Bilva > Hazard for -4. 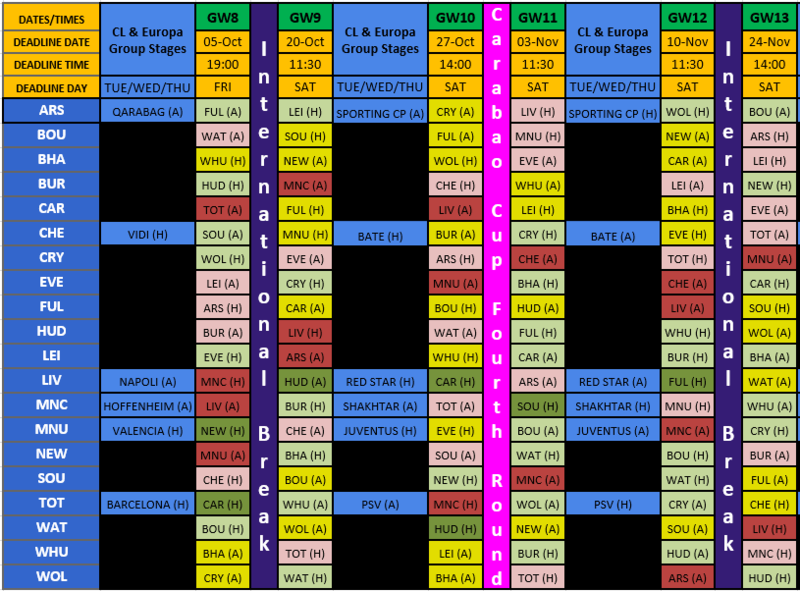 May trigger the WC and make a few more moves (which would also cancel out the points hit). I have just enough cash to do Pereira > Zabaleta, Robertson > TAA, Cairney > Knockaert and Ralls > Maddison, which would give me the team shown below. I think -4 is OK for now mate. Keep the WC for after the IB if you need it. Cheers Ivan. Yeah, that’s what Kralin said too. I would go with Trippier or Maddison, too many people will go with Hazard and Kane, and I think this two will have a great score this gameweek. GW 9 and 10 Salah captain.